What Will They Find in This Sarcophagus They're Opening Live on TV? 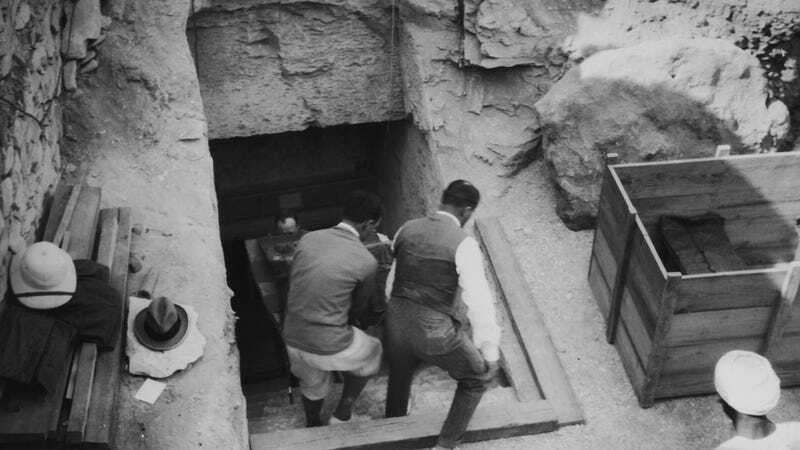 Filed to: what's in that tomb?Filed to: what's in that tomb? In a first, the Discovery show Expedition Unknown will be opening a sarcophagus LIVE from Egypt. Hey, it worked for Geraldo, and he didn’t even find anything in Al Capone’s vault! Some sort of liquid whose origin doesn’t bear contemplation? A bottle of Good Genes, Supergoop! sunscreen, and a dusty skull with multiple head fractures, inside of a straw tote bag? A plague of Bufo toads? A complete run of The Joan Rivers Show, digitized and ready for streaming? An ominous hot wind and a stomach-churning feeling of vague, overpowering dread? Tune in Sunday to find out! Who&apos;s In This Mysterious Black Sarcophagus That We Should Definitely Open?